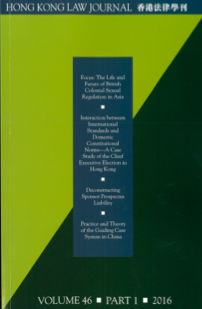 "The Politico-Economic Context of Special Regional Autonomy: International and Constitutional Law Meets the Hong Kong Predicament"
Abstract: However elastic the interpretation resorted to, the gap between norms embodied in legal instruments, international and domestic, and multi-level behavioural patterns crystallised in the course of their implementation may be sizeable. The potential for this divergence and the factors responsible for it have not received adequate theoretical attention in the literature, including regional autonomy, especially in the challenging and delicate Hong Kong environment. The book under review amounts to a possible quantum leap in this regard because of the authors’ willingness to cross the boundaries between formal and informal inquiry, engage researchers from several disciplines, conceptualise the problem in broad and complex terms, not to be rigidly constrained by static logic and embrace dynamic evolution as an inescapable reality. Some questions inevitably remain unanswered, but a solid foundation for a less reductionist and more fruitful line of academic investigation has been laid.